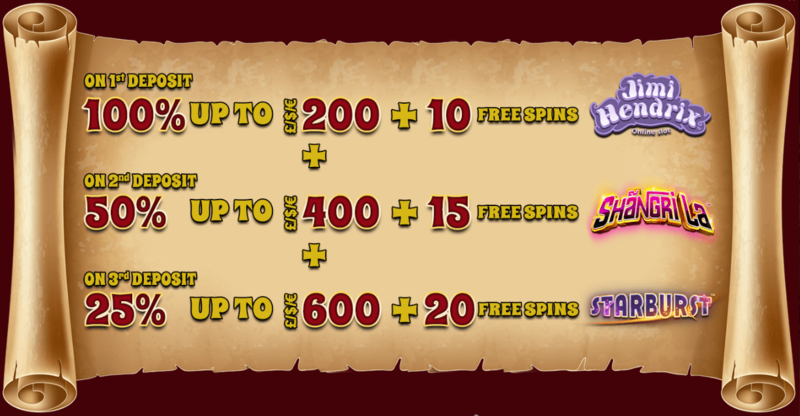 Fresh players that join Casino Big Apple are in for a treat! They have the opportunity to enjoy all the perks this gaming site has to offer. Fun games or great promotion, here your gambling session will be remarkable. Access the platform by clicking the blue button and create an account with your information in a few easy steps. The user-friendly interface will make things easier. To get this outstanding first deposit bonus of a 100% up to £200, plus 10 bonus spins on Jimi Hendrix, you need to make a payment of over £10. Simple as that. The maximum cash out from the bonus is capped at 5x and from the spins is £20.